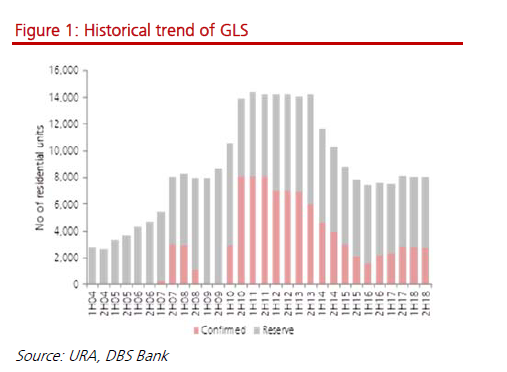 An Insights report by DBS said that it is positive on Singapore property in the medium to long term, but that near-term sentiment weakness remains. The bank expects demand to be sustainable in the medium to long term on strong economic growth driven by upgraders’ market and potential foreign buying in the future. 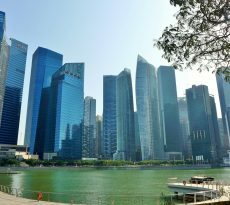 The bank however noted that near-term sentiment for Singapore property market could be marginally impacted with a softer sales volume registered in the first half of 2018 and potential government policy risks. The government on 27 June announced the second half 2018 Government Land Sales (2H18 GLS) Programme, which comprised six Confirmed List sites and nine Reserve List sites to yield more private residential units. 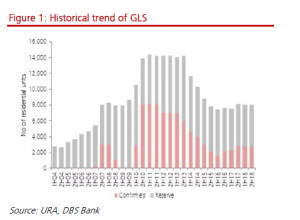 The bank noted that the 2H18 GLS of 8,040 residential units, is flat half-on-half (h-o-h) – (-0.1% h-oh; -1% year-on-year) – with a view that there is a healthy supply of private housing in the pipeline for demand over the next 1-2 years while it continues to monitor the market closely. Confirmed and Reserve lists stayed relatively flat h-o-h (- 2.5% h-o-h; +1.2% h-o-h respectively). In this Government Land Sales, the government added two new white sites (Marina View and Pasir Ris Central) and one hotel site (Club Street) after the Holland Road and Sengkang Central sites were awarded and launched, releasing a total commercial space of 124,000 sqm (close to double the commercial space in 1st half of 2018) and 930 hotel rooms. The last hotel site was awarded in 2014. Given the dwindling new supply of hotels and the strong growth seen in visitor arrivals, the bank believes the new hotel site (located in Chinatown) would be able to replenish new supply into the industry as new supply dries out from 2020 onwards. 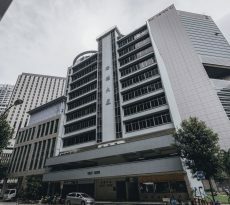 The report said that the interesting sites to watch are mostly the white sites (Marina View, Woodlands Square and Pasir Ris Central), CCR sites such as Kampong Java Road, Middle Road and Tan Quee Lan Street sites and the EC sites (Tampines Avenue 10 and Anchorvale Crescent). As expected, there are no major changes in the supply of residential land to the market from the 2H 2018 list as compared to the 1H2018 list. Developers are still able to procure land from the private market and the robust collective sales market over the past 12 to 18 months; this has created a strong pipeline of residential units in the near to the mid-term. Not surprising, more potential dwelling units are placed on the Reserve List as this allows sites to be triggered as when the market calls. Two Reserve List sites at Peck Seah Street and Woodlands Square have been removed and three new white sites have been introduced instead. As such, more flexibility in the development use can be taken advantage of by the potential developers. In addition to options available from the Marina View white site, a Hotel site along Club Street has been added to the Confirmed List. This is testament to the optimistic tourism arrivals and spending numbers over the past 12 months, as well as healthy RevPAR (revenue per available room) levels. 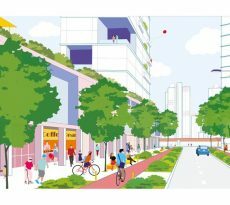 A white site adjacent to Pasir Ris MRT station has been introduced on the Confirmed List which may add a new retail and lifestyle facility in the vicinity to complement the existing recreational developments like Downtown East. This Pasir Ris Central site is expected to be launched in August 2018 and is likely to garner healthy interest from developers with strong retail play. The new Woodlands Square site is a new site listed on the Reserve List with better proximity to the MRT station and Causeway Point. This site can reemphasize the focal point of the Woodlands Square vicinity especially with the Johor Bahru – Singapore Rapid Transit System link in place and with the future development of the North Coast Innovation Corridor. 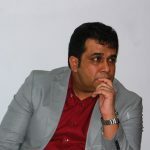 If you are hunting for a Singapore property, our Panel of Property agents and the mortgage consultants at icompareloan.com can help you with affordability assessment and promotional loans. The services of our mortgage loan experts are free. Our analysis will give industrial property loan seekers better ease of mind on interest rate volatility and repayments.